We want to transfer the data from the data sheet to the Excel files, which we call Alias files. We will use the Alias files to automatically generate documentation, code, and IDE support. 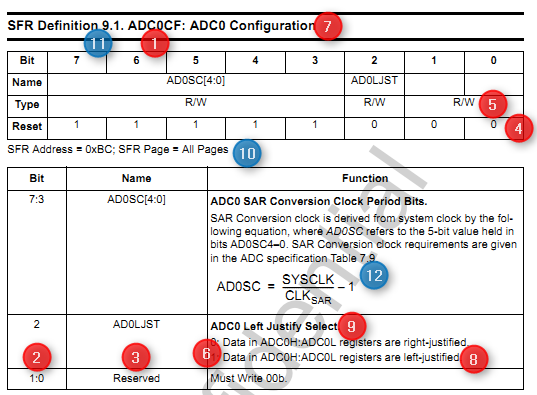 Here’s the SFR definition for ADC0CF from the data sheet. 10) The SFR address and page information does not need to be stored in the Excel file. When we generate documentation and IDE support files, the addresses will come from a different file. 11) The SFR Definition number is not stored in the Excel file. 12) We have a special mechanism for documenting functions in the Description field. For now, you can simply do an approximation of the equation in the text. 13) Module Name. Choose any name that is short and appropriate for now. Use names similar to the corresponding 32-bit peripheral if available. 14) Offset. In the Excel file, each register must have a unique offset. Start at 0x00 and increment by 1 for each register. 15) In this example, the reset value for the AD0SC bits is 11111b, so the reset value is 31, which gets entered into each row. From above requirements, we can see that is hard work with copy and paste by hand. We need to think about make a code to automatically get peripheral register contents and write into excel files with proper style requirement. However, we can see some fields need human intelligence to name the field. That is Okay, we can leave them there and fill by hand later. And most of fields can be done by code. Python is popular in company, so Python3 is our prefer script language. Since data sheet is PDF file. I have studied background knowledge of python parse PDF file. And finally I found this blog, http://chuckin-py.blogspot.com/2010/03/hacking-pdf-with-python.html. The author planed to do similar thing as I want. But he found that is hard to achieve it. I didn’t know PDF file even has not table. So I need other file type. And we have .txt file, it is easy to access. We will have a look in it in detail later. Compared several 3rd party tools, I choose openpyxl since it supports excel 2007 and python Here are the steps to install it in your PC, of course you already installed Python 3. For excel 2007, default font is Calibri, and default font size is 11. It is not so regular, isn’t it? The arrow in the snapshot is tab(‘\t’), and CRLF is ‘\n’. 1. 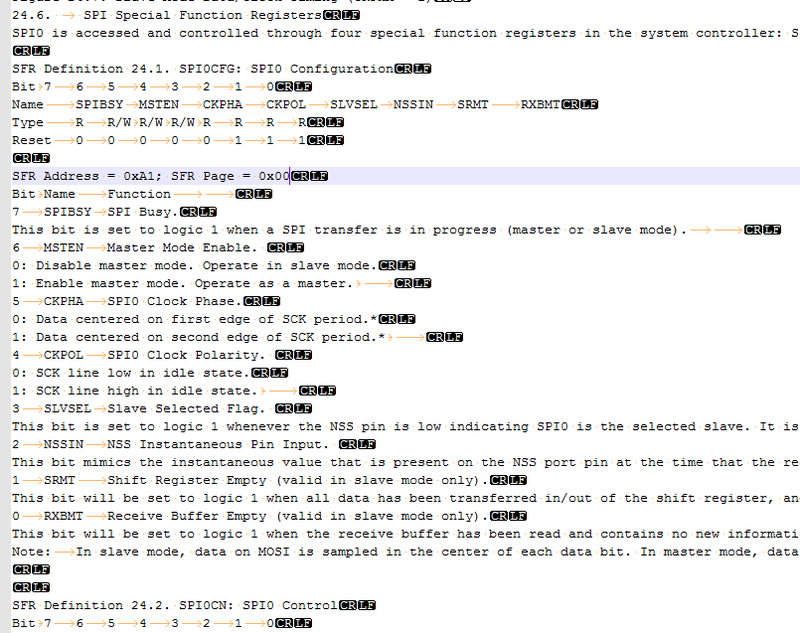 Every register description start with "SFR Definition"
2. Register bit type field start with 'Type\t'. 5. We have several situations in description part. e. Double “\n” indicates reach end of this register. With Python3 internal function we can deal with all string relate context.